View of “The Artist Is Present,” 2018. For an exhibition curated by Maurizio Cattelan in collaboration with Gucci and whose retro-fetishizing aesthetics center on repurposing and appropriation—and which occurs in China, a place often criticized for rampant and blatant plagiarism—“The Artist Is Present” deals surprisingly little with the commercial derivatives of the word copy, namely knock-off, counterfeit, or pirated. Instead, it venerates the logic of copying as the paradigmatic mode of every form of creation. The show comprises seventeen rooms, each customized to generate an atmosphere that mimics a gift shop or a prestigious institution through a combination of floor tiles, construction materials, and lighting conditions. Many works directly adopt a social environment or cultural heritage, such as the Danish artist group Superflex’s 1:1 duplication of restrooms (Power Toilets / Council of the European Union, 2018) and Xu Zhen’s sculptural amalgam of figures of divinity (Eternity - Northern Qi golden and painted Buddha, Tang Dynasty torso of standing Buddha from Quyang city, Northern Qi painted Bodhisattva, Tang Dynasty seated Buddha from Tianlongshan, Northern Qi painted Buddha, Tang Dynasty torso of a seated Buddha from Tianlonshan grotto No. 4, Parthenon East pediment, 2013–14). A more implicit form of appropriation takes place in a room where art objects are set against a green screen, a signature display mode of Mark Leckey. Similarly, a room painted red and featuring five American artists is flooded with hazy yellow neon light—a wink perhaps at Alex Da Corte, although neither Leckey nor Da Corte is cited. The exhibition’s penultimate room proves unexpectedly nostalgic and approaches copy in its most passive form: family lineage. 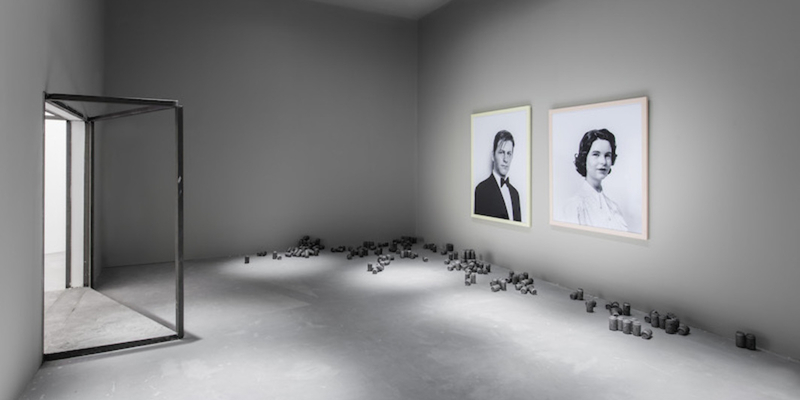 The eeriness of Gillian Wearing’s masked black-and-white self-portraits of her parents (Self Portrait as My Mother Jean Gregory and Self Portrait as My Father Brian Wearing, both 2003) is accentuated by Kaari Upson’s pseudo-archaic Pepsi can sculptures (MMDP My Mother Drinks Pepsi, 2014) scattered on the ground. Permeated with a sense of bleakness, the room serves as a reminder of the ultimate inevitability of copy encoded within us.